So this has been a crazy week here at Shugary Sweets! Spring Break has started today and we are heading home to visit family. I find it only fitting that I share this new macaroni and cheese recipe. A couple years ago I shared THIS delicious mac and cheese, claiming it was the best ever! This new version is based off that original recipe! Which makes this the “even Better” mac and cheese! I started by changing out the cheese. My husband and I love gouda. In this recipe I used a combination of smoked gouda and sharp cheddar! I realized when I was in the middle of making this recipe, I had no Ritz crackers. My last recipe called for topping it with crackers. So instead I took a few slices of bread and processed them to a fine crumb in my food processor. I added butter and mixed it with a fork. I think you will love this version too! Oh, and then there’s bacon on top. Not a lot, but just enough that each serving has a few sprinkles! I hope you enjoy this NEW macaroni and cheese recipe! What’s YOUR favorite comfort food? **Shugary Sweets changed to a new server this week! Did you miss me? My new host, SERVINT, is wonderful, the best customer service out there! And my website is super fast thanks to them! Can’t go wrong with Gouda-my favorite cheese for mac and cheese! Looks very comforting and very delicious! holy wow – this looks incredible!!! YUM! This looks so great – and Gouda is my favorite!! Gouda…you had me at gouda. Holy cow, girl, I am drooling over this at 8:42am. I love it and wish I had a bowl for breakfast! You have no idea how good this sounds to me right now. Gouda is my all-time favorite cheese. Gorgeous pics too! My tummy just rumbled. It’s hungry after reading this post, even though it’s not even close to lunchtime yet! Oh god I’m on a smoked gouda kick right now. Totally drooling over this. Okay. I’m going to have to try this smoked gouda stuff and try gouda in the US. I use it here in Germany for mac and cheese, but it always yields a pretty weird consistency. Definitely not like yours! And bacon and carbs. It’s like, the best thing ever. This looks amazing! 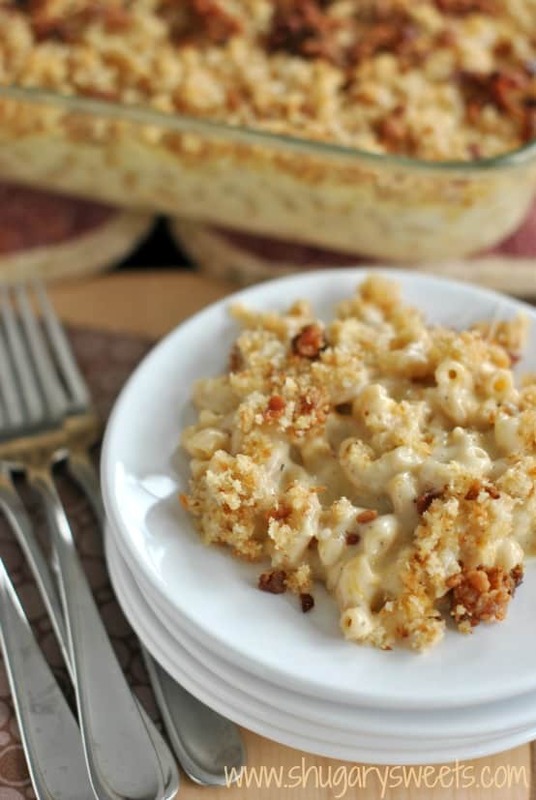 This mac and cheese sounds like pure comfort food at its finest! Have a good time visiting family. Yummy! Bacon and cheese are awesome on top of pretty much anything! Mac & Cheese is the ultimate comfort food. I love it with bacon! oh my lands!!! This is totally craveable. This looks crazy good, Aimee! 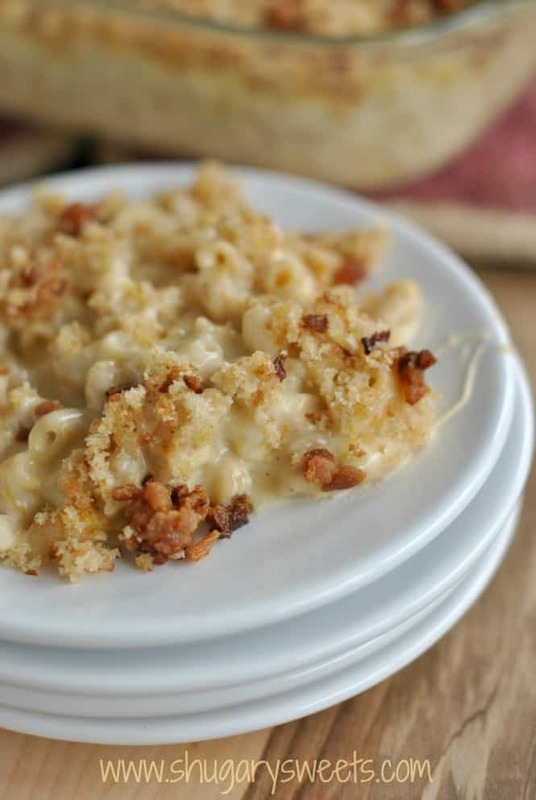 Bacon in mac & cheese is always good, and gouda makes it sound even better! Yes yes yes! I love gouda and bacon together. You really can’t go wrong! Oh, what a fabulous combination – looks delicious! I am in need of some serious comfort food, it has been a rough few days! Happy Easter and safe travels! Gouda and bacon, oh my goodness. This is heavenly, it looks so delicious! Is their anything more soothing than macaroni and cheese? 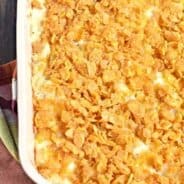 This gourmet version of creamy gouda and crunchy topping looks fantastic! OMG. Like, seriously? No words. Just want to eat. Ugh, I’m sick right now and even though soup is supposed to be sick food, I think this mac and cheese would REALLY be comforting. All I could do as I read this was shake my head. And as I read on, my head shaking got wider and wider.. It sounds freaking amazing! Mac n cheese is my favorite comfort food. I was deprived as a young Puerto Rican kid since my mom never cooked southern food. But that all changed when my southern raised wife introduced me to all its glory. With mac n cheese being my favorite comfort food… gouda being one of my favorite cheeses… and bacon being my in-home mistress.. This thing HAS to be made. I would even eat bacon for a plate of this 😉 It looks amazing!!! holy moly this keeps grabbing my attention over and over again! It sounds so heavenly!! 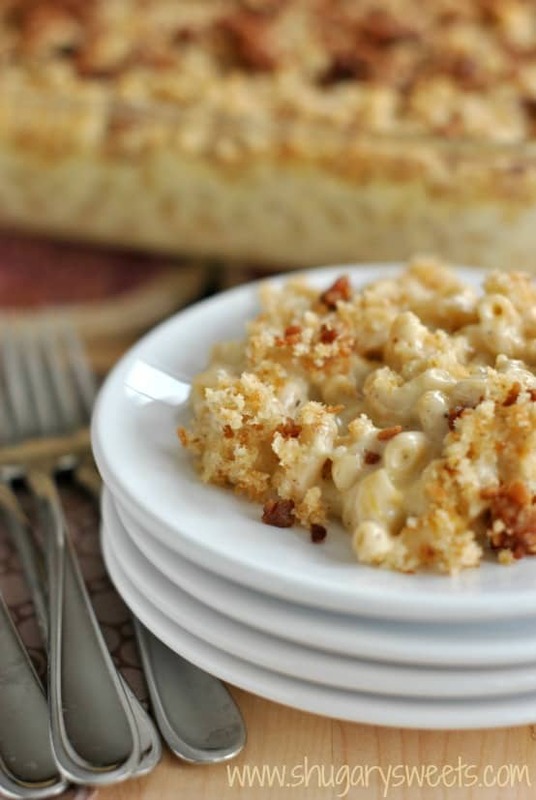 Your macaroni and cheese sounds so delicious and comforting, I can’t wait to try this recipe! I finally made this last night and oh my gosh was it good! So decadent and creamy! Wonderful recipe! About to make this for the second time tonight. It’s already become a family favourite. This is cooking in the oven right now. Can’t wait to try it! That looks and sounds divine! I must make this soon! OMG! I saw the title of and started giggling like at fool (at work) cause it something i HAVE to make, soon. I made this for the second time this weekend. Last time I had the gouda at room temperature when I added it and it melted just fine. This time it still melted eventually, but it took FOREVER. Next time I’ll be sure to take it out of the fridge an hour before I need to use it. I’m 26 years old and have very recently decided to ditch the microwaveable meals and teach myself how to cook. It has been quite the overwhelming experience as I am not accustomed to epically failing in any of my endeavors. Pinterest has been my digital cookbook and I have been on the brink of tears after my last few attempts at making something worth eating and worth sharing on Instagram. How is it possible to be sooo awful at something that seems so easy? 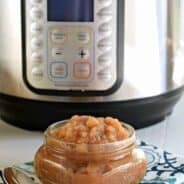 I had almost given up hope and found myself lingering in the frozen food isle when I came upon this recipe and decided to give this cooking thing one more chance. Oh, my, GOSH. I did it. I actually did it. Not only did your recipe turn out EXACTLY like your pictures but it was HEAVENLY. As I was cooking, I did not realize that the recipe yielded enough for 10 to 12 people, so my boyfriend and I took all of the extra food to work this morning and I am now the talk of the labor-hood. Comments such as, “oh my gosh, I neeeeed that recipe” to “girl, I can even taste the love you put in to this” have been pouring my way. Cheesy (put indeeded) as this may sound, it was the self-esteem boost I needed to no longer feel defeated and feel confident in the kitchen. I have been pinning some of your other recipes and I can’t wait to make them this week! Thank you for posting this! You saved me from defeat and saved my boyfriend from eating more In-n-Out and Chipotle for dinner. Hooray!!! I’m so glad you enjoyed the recipe! Yeah, it makes a ton of mac and cheese!! So happy you found a place to share. this is the second tome making this,[for a baby shower today] …..the first time i didn’t ‘see’ smoked gouda so i added smokey paprika ….was wonderful !!! ‘momma’ requested this for today, so pleased that it was an easy recipe and so much flavor,….thank you, thank you , thank you!!!!!!!! I made this for dinner last night and it was everything I hoped it would be. It was so delicious that I had to force myself to not eat all of it. Next time I make it I’m going to add some bacon to the noodles and cheese and cut back a little on the bread crumbs. I used bread crumbs and thought the 1 1/2 cups was a little too much. So glad you enjoyed the recipe. It’s hard to stop eating! thanks for all the feedback Darlene! This sounds amazing! I’m looking for a version of mac & cheese that I could bake in muffin tins, making little individual “finger foods.” Do you think this would work? I made this today for my family and it is just wonderful! 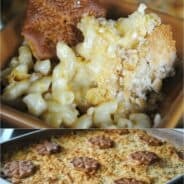 I did not change a thing and my husband ( who is a big mac & cheese guy) was in Heaven:) Not something we could have on a regular basis but as a Holiday or just need a comfort food this will be high on the list! Haven’t made it but it looks really good. Adding it to my thanksgiving menu. It seems like the kind of recipe I do ahead but to the last step and reheat in the oven before serving. 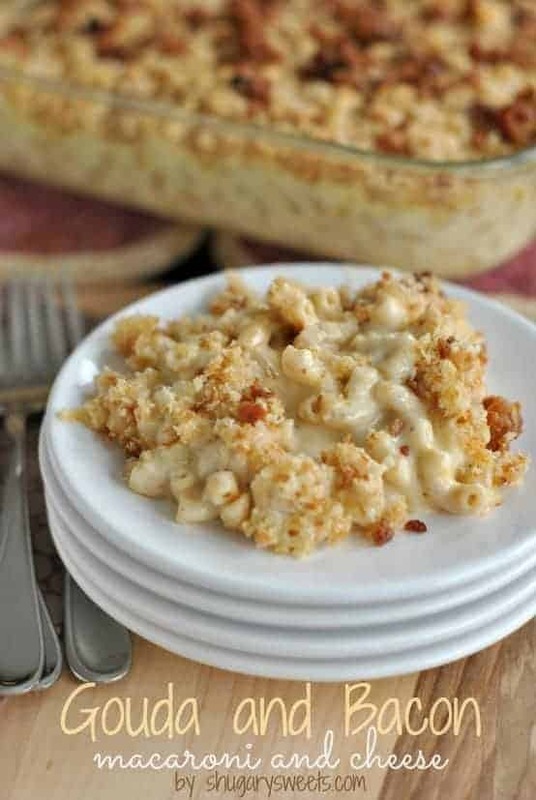 I love gouda in my M&C and I am going to make this while my family is in town for the holidays! It looks fantastic! My family loves macaroni and cheese too. It’s always interesting to see how creative it can be. I like the smoked Gouda addition. I think you’re going to LOVE this recipe!! ENJOY and have a Happy Thanksgiving! This was AMAZING! Replacing the old family recipe with this one. I used a truffle gouda and aged white cheddar and omitted bacon (bacon was in another dish that evening, so didn’t want to over do it). Used panko instead of bread because I was out of bread. Even though I didn’t totally stick to the recipe, the roux to cheese to pasta ratios were right on so even with some variances you can’t go wrong. Everyone raved about it! Oh, I forgot to mention, I used cavatappi nooodles. I have seen this in high-end restaurants and with the pricey cheese I wanted it to seem “oo-la-la” with fancy noodles. It was great! Sounds delicious, glad you enjoyed the base recipe!! I’ve recently discovered just how fantastic Gouda is so I can’t wait to make this dish! Totally creamy and tasty, but don’t put bacon on top, it burns, mix it into before cooking. This was Delicious!!! I thought it was going to be over powering with that much gouda but with a fresh cold salad it is just right! Thanks Renee, I’m so glad you enjoyed the recipe!! Looking forward to this. 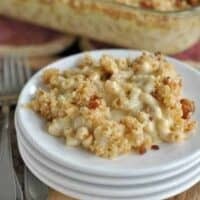 I had mac & cheese made with smoked gouda a few years ago and loved it. Making it myself the first time for Thanksgiving. I usually tweak any new recipe I get, but I had a few questions I was hoping you could answer first. I saw that you’re mixing the smoked gouda with a sharp cheddar. That sounds like a very good addition. Is this something you came up with? Have you tried adding bacon to the mixture instead of just on top? I’m thinking it would work well. Have you tried panko bread crumbs? I use them on another cheese casserole recipe I make. Thanks. And whatever I do, I’ll come back and comment on the results. I served this with an lemon/olive oil dressed arugula salad, toasted beer bread (from the crumbs), and chardonnay. Wow Aimee – this recipe is spot on! We have a very nice upscale restaurant near us that serves the BEST gouda and bacon mac & cheese ! They are well known for this dish and I’ve been dying to find a recipe that would resemble theirs. I knew by the ingredient list that this was going to be the one! Made it tonight – both my husband and I love it! Thank you! I have made this two years in a row now for an annual potluck style “Friendsgiving” celebration. Both times it has been hands down the most raved about dish…. and most requested for a comeback this year! My advice, make more than you think you will ever need! The leftovers are great, and if you’re sharing, everyone will want to take some home. I use the usual Ritz cracker/butter topping but I’m sure it’s phenomenal with breadcrumbs too. Comments should be made by people who actually make the recipe. What good is it say this looks amazing? I made this tonight! I changed it up a bit by mixing the bacon into the mixture and also added some mushrooms (lightly fried beforehand in the bacon grease). I also used half and half instead of heavy cream. Turned out so well!! Oohh, love the addition of mushrooms! Looks good smells good almost ready to stick it in the oven. I like Broccoli so I added a little of that an backed off a touch on the smoked cheese. I hope my wife likes it. I just picked up the ingredients but accidentally grabbed chipotle gouda instead of smoked. I’m thinking I will double the cheddar that I am using and only use half of the gouda since I have the wrong kind and I don’t want the chipotle to be too overpowering. Hopefully it turns out great! I’ve made this twice now and both times its just amazingly delicious!!! My family eats it up. The sauce is just the best. The only thing I changed when making it is I started my roux with the butter and flour then added the milk. I had zero issues with the cheese seizing up that way. Awesome to hear, thank you for your tips too! I have made this quite a few times and always to much praise. Thanks! One handy tip after making it a few times (and in large quantities) is instead of sprinkling the flour into the pot and whisking…whisk the cream and flour together beforehand into a slurry. The results are so much smoother and way easier! Thanks! Rookie mistake…make sure to add the flour slowly lol….turned out awesome (the second time…) thank you! Made it a day ahead and heated it to serve. Will make again!